The most important French past tenses are the passé composé and the imparfait, and they are troublesome for several reasons. While l’imparfait is more or less equivalent to the English past progressive, l’imparfait is more widely used, especially with verbs like avoir and être. As for the passé composé, it has three English equivalents. Be sure you fully understand these two French tenses before continuing with this lesson. For French students, the trickiest aspect of these French verb forms is that they often work together, juxtaposed not only throughout stories, but even within individual sentences. Understanding the contrasting relationship between the passé composé and imparfait is essential to communicating in French. 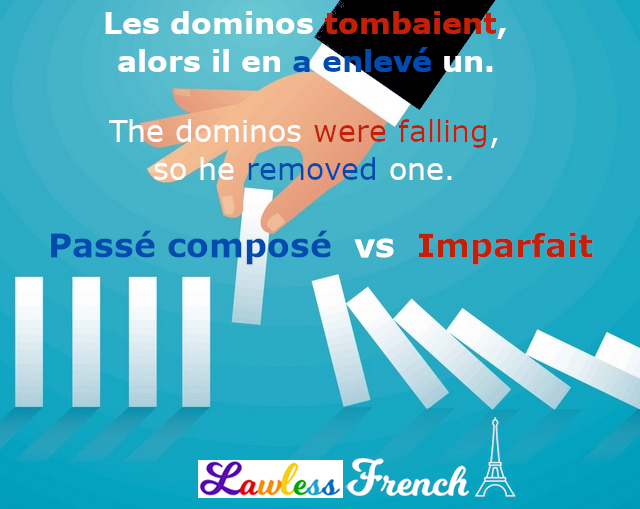 In a nutshell, the imparfait is used for incomplete actions while the passé composé is reserved for completed ones, but of course it’s more complicated than that. Imparfait explains what was happening, with no indication of when or even if it ended. Passé composé announces what happened, actions that were completed. J’étais à l’école. I was at school. Je suis arrivé tôt. I arrived early. Je faisais mes devoirs. I was doing my homework. J’ai fini mes devoirs. I finished my homework. Imparfait details what used to happen on a regular basis, or happened an indefinite number of times. Passé composé expresses what happened a specific number of times. J’étudiais le lundi. I used to study on Mondays. J’ai étudié lundi. I studied on (a specific) Monday. Je perdais constamment mon livre. I was always losing my book. J’ai perdu mon livre deux fois. I lost my book twice. Imparfait indicates an ongoing state of being or feeling. Passé composé reports a change in a state of being, a new feeling. J’aimais l’école. I liked school. À ce moment, j’ai détesté l’école. At that moment, I hated school. J’étais toujours inspiré par mes profs. I was always inspired by my teachers. J’ai été inspiré par ton succès. I was (became) inspired by your success. Imparfait describes what was happening or how something was when … … the passé composé interrupted with news of some occurence. J’étais à l’école quand … I was at school when … … il a commencé à pleuvoir. … it started raining. J’essayais d’étudier mais … I was trying to study but … … mon ami m’a posé une question. … my friend asked me a question. To give you an idea of how these tenses work, together and separately, here are three similar stories using each tense individually and then both together. Quand j’étais lycéen, j’étudiais tous les jours. Je voulais être accepté dans une grande école parce que je souhaitais être politicien. Je lisais les journaux régulièrement et je commentais constamment l’actualité en compagnie de mes amis. When I was in high school, I studied every day. I wanted to be accepted into a prestigious university because I hoped to be a politician. I read newspapers regularly and I talked about current events all the time to my friends. Quand j’ai décidé d’être politicien, j’ai commencé à étudier tous les jours. J’ai fait des recherches et j’ai choisi une grande école. Cependant, je n’ai lu le journal que trois fois en un an, et, un soir, quand j’ai parlé de l’actualité pendant un dîner, je me suis rendu ridicule devant tout le monde. When I decided to be a politician, I started studying every day. I did research and chose a prestigious university. However, I only read the newspaper three times in one year, and, one evening, when I talked about current events at a dinner party, I made a fool of myself in front of everyone. Quand j’étais lycéen, j’ai décidé que je voulais être politicien. J’étudiais tous les jours parce que je devais, pour cela, être accepté dans une grande école. Je lisais les journaux régulièrement, et, un soir, quand j’ai parlé de l’actualité pendant un dîner, j’ai impressionné tout le monde. When I was in high school, I decided that I wanted to be a politician. I studied every day because for that I needed to be accepted into a prestigious university. I read newspapers regularly and one evening, when I talked about current events at a dinner party, I impressed everyone. Some words and phrases are virtually always used with the imparfait, while others seem to stick like glue to the passé composé. These lists can help you determine which tense you need in any given sentence. I have a general idea of how the passé composé and imparfait work, but sometimes I am confused about which tense to use with être and avoir. For example, in “J’ai été raisonnable, je m’en suis tenu à ne manger que cinq gâteaux,” I’m not sure I understand why it wouldn’t be j’étais. Could you help explain why? Merci ! If I want to tell somebody that “when I had exams and a lot of homework, I took breaks to rest, I studied with my friends and I tried to remain calm ….” Would you use passé composé ou imparfait? When I had … is background information, so you’d use imperfect. The rest are “interrupting” that state, so you need passé composé. Je cherchais une explication simple pour mes étudiants ougandais, et je trouve ton article très clair et complet à la fois, merci! The fact that you’re still working at the same place right now is irrelevant here. There is a very strange debate going on right now. Several other French teachers have insisted that the imperfect can never be used for things that are still true. For example, Où travaillais-tu lors des attaques le 11 novembre? I would say, Je travaillais ici! Je suis prof ici depuis 2002. Their stance is that you´d have to respond in the PRESENT TENSE.